Home101Easy Halloween Menu | Eat, Drink & Be Scary! Easy Halloween Menu | Eat, Drink & Be Scary! Halloween is here and even with all the trickin’ and treatin’ and costumery going on, there’s still time to serve up a tasty Halloween treat or two. My easy Halloween menu will help you eat, drink and be scary! 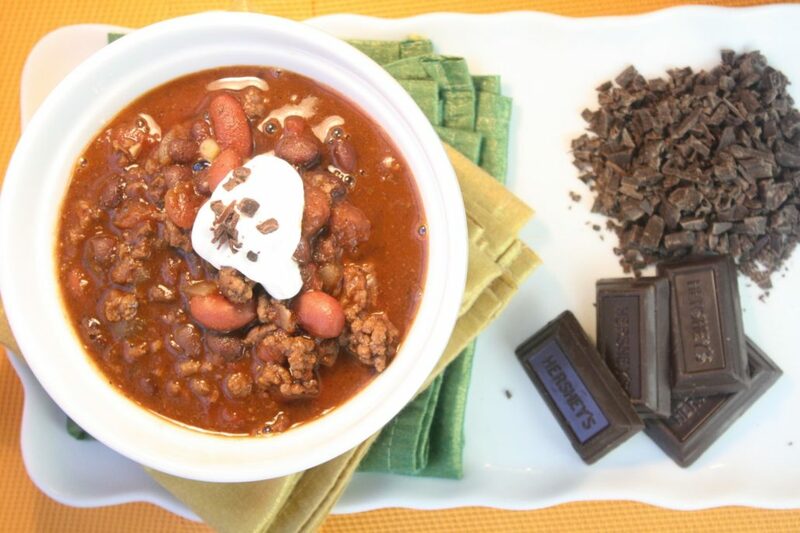 Festivities aside, dinner’s still gotta happen and my Chili with Dark Chocolate is the perfect Halloween meal. It’s warm, delicious and it fits our Halloween theme to a T. There’s candy in it! Yep, chop up some of those Hershey Special Dark bars (or your favorite dark chocolate) and stir it in post-simmer for a chili thats rich in flavor and ghoulishly good. Serve it up with a batch of cornbread and you’re ready to go! Watch me make this chili live on Great Day Washington! Every holiday needs a cocktail and a Jolly Tancher Vodka Cocktail is ‘da bomb, or dope or whatever the young people are saying these days when something’s really, really good. Jolly Rancher candies are known for their big, distinct flavors and when they’re dissolved in your favorite vodka you get a vodka bursting with those familiar flavors. These Candy-Coated Apple Slices are SCARY good! They’re simple to make and a great way to get your candy crush started. They’ll will give you a caramel apple fix without having to commit to eating the whole apple – and without the mess.